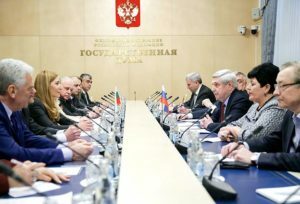 First Deputy Chairman of the State Duma (lower house of the Russian parliament) Ivan Melnikov received Minister of Tourism of the Republic of Bulgaria Nikolina Angelkova and a parliamentary delegation led by Vice-Chairman of the National Assembly of the Republic of Bulgaria Yavor Notev who are on a visit to the Russian Federation, parliamentary website reported. The parties noted the recent resumption of the political dialogue between Moscow and Sofia and welcomed intention of the leaders of the two countries to strengthen Russian-Bulgarian ties. The meeting participants also expressed their hope that this year, marking the 140th anniversary of the establishment of diplomatic relations between Russia and Bulgaria, bilateral ties will be further developed. The parties paid special attention to trade and economic cooperation and were pleased to note that Russia is among Bulgaria’s five top trade partners (in 2017, bilateral trade rose by 24% to $3.5 bln).